Typing intensively while on the treadmill desk will create more muscle strain than walking with your arms by your side. 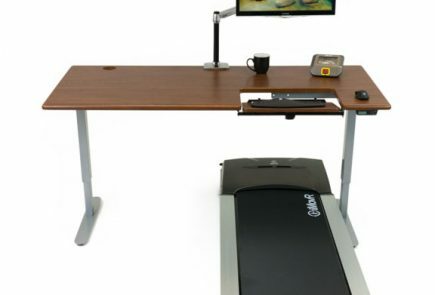 So experienced treadmill desk users have learned to accumulate intensive writing tasks for those hours when they are sitting or standing, and to save up emails and online articles (and videos) to consume, and phone calls to return for walking time. Having said that, some people find that the increased focus they gain while walking makes it the ideal time to compose documents and develop creative works, so this is a very subjective preference. Just keep in mind that when you do dive into intensely focused work you will more readily lose track of time, so set a timer to remind you to take a stretch break every 30 minutes. From a biomechanical engineering standpoint any time you constrain a usually unattached segment (in this case the arms/hands tethered to work surface) the joints between the two points of attachment are subject to more “excursion” – which we may ultimately experience as cumulative trauma. Furthermore, when we walk normally our arms and body are usually swaying in a completely subconscious rhythm in order to minimize strain on our leg and lower back muscles, and keep our bodies balanced. When walking on a treadmill desk and tethering to either the keyboard or mouse we place undue strain on those muscles, hence the importance of optimal ergonomic settings and taking frequent stretch breaks. For consuming content you often don’t need to touch the keyboard much, if at all. All you really need is mouse control. One very clever way to do this without having to physically tether yourself to the desktop is by using one of the many new hand-held trackball mouse or ring mouse devices. When you’re walking you simply hold the mouse in your hand so you can swing your arms back and forth and eliminate the undue strain on your walking muscles as well as your wrist/arm/shoulder muscles and joints. Best of all, you can still use these same devices in lieu of a traditional mouse at all other times.